If you’re anything like my husband and me you can’t ever decide where to eat or break away from routine places. We get stuck in a rut sometimes, all good food in the rut (see below), but a rut none the less. At one point we had a few of the favorite “ruts” listed on a cork board in his office. We would throw darts at it to choose where to go. So now I’m putting together my dinners bucket list, a few places I want to try. Who knows the rut list might even get a few new contenders. I found a few resources helped with the task. Personally, I find the web to be the largest place for current information. There are lots of restaurant guides out there but for this post I’m narrowing it down to two. First , www.urbanspoon.com , the site is user friendly and has a quick catagory reference on the front page. Their mobile app makes it easy to find something new or read a review when you are on the go. Second, there is www.restaurantrow.com that is comprehensive and easy to use. It allows the hungry user to view the menu, read reviews and make reservations! If you consider yourself to be a worthy food critic you can even become one of the Row’s reviewers and make a little extra money. So using these resources I have my dinners bucket list. The Goody Goody Omelet House – That’s right, I’ve never been there! Got any good suggestions out there? One day I would very much like to write a cookbook. I have begun to collect my favorite recipes and compose a few of my own. I pulled this one out of my hat last weekend and I can’t wait to try it again. To make the filling use an electric mixer to cream together the cream cheese, powdered sugar, apricot preserves, vanilla and almond extract. Set aside. Open and unroll one tube of crescent rolls placing them in the bottom of a 9×13” baking dish. Spread filling evenly over crescent roll. Top with the second container of dough, pressing down slightly. 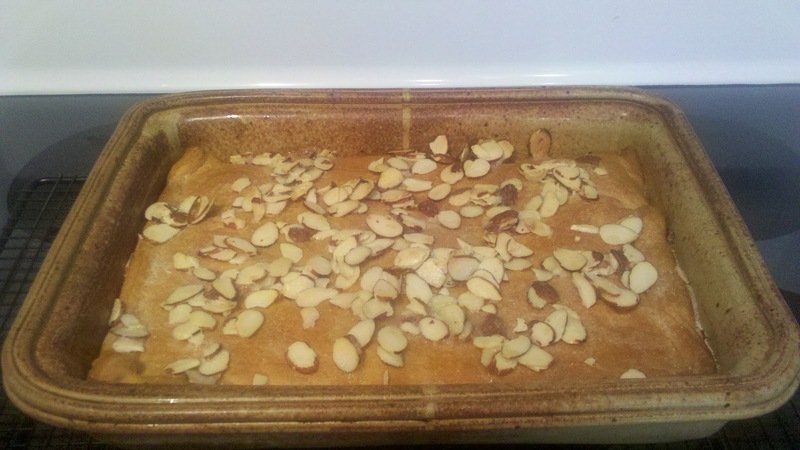 Pour melted butter over the top, sprinkle with almonds and granulated sugar. 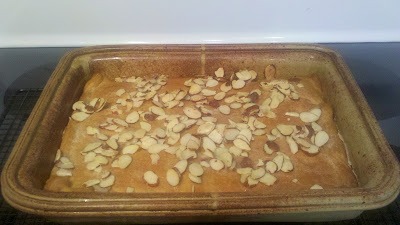 Return to the oven for an additional five min or until the almonds have toasted slightly. Warm and toasty out the oven. I think next time I’m going to try it with the brandied cherries that a friend made for me!